Singaporean all time favourite! 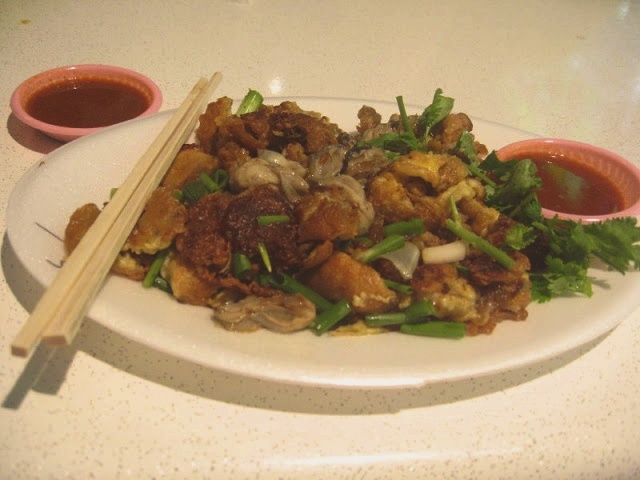 Oyster Omelette. The perfect marriage of just-cooked-to-perfection oysters, eggs, a somewhat crisp finish of the flour mixture is what to expect from this dish. Wash the oysters in cold water and drain well. Mix both cornflour and rice flour together with the water to make a fairly thin batter. Heat a large heavy frying pan until very hot and add oil. Pour in the batter and cook for about 15 seconds until batter is half set before adding in the eggs. When the eggs are almost set, make a hole in the centre by pushing the egg and batter mixture to the side of the pan. Pour in a little more oil and fry the garlic for a few seconds. Mix, then season with soy sauce, sake and pepper. Add oysters and cook just long enough to heat through. Garnish and serve immediately with fresh coriender leaves and spring onions. Note: As the oyster has such a delicate flavour, oysters are best eaten raw unless they are cooked very lightly in a matter of minutes or seconds. Throw all ingredients into a mortar and pestle or a blender, blend until you get a sauce like consistency and taste. Serve with oyster omelette. must use fresh oyster. can get it at sheng shiong. wow u guys are having a very good culture…and i think ur food is really tasty……. This is amazing, love the fresh oyster. Delicious! I’ve just saved the recipe and will definitely be making this soon! Hi all! Tks for your comments. I have updated the recipe for the chilli sauce. Pls do try and leave your comments and feedback. I used to get this food from the hawker stalls when I was in Singapore. I tried your recipe above and according to my son, it’s delicious. Thanks for this recipe. Thank you shared this wonderful recipe. the presentation of the food is excellent.